There are few rooms in your home that are frequented as often as the bathroom. Think about it; you spend quite a bit of time in there. Among other uses, your bathroom serves as a place to escape from the world for a few moments and spend some quality alone time. Since this room is such an intimate setting, it is no wonder why remodeling the bathroom is at the top of home renovation lists all over Arlington. With nearly a decade of residential remodeling and construction experience to our name and the best remodeling team in North Texas, TriStar Repair & Construction is the company capable of providing professional bathroom remodeling Arlington, TX can trust. Since people spend so much time in the bathroom, it is essential to remodel it in a manner that makes the space functional, inviting and beautiful. TriStar keeps this in mind during every job and has been offering top-quality Arlington bathroom remodeling services since we started doing business in 2006. With nearly 380 thousand people living in Arlington, there is bound to be a myriad of ideas about what elements make a bathroom beautiful and what elements should change during a remodel. Think about your own bathroom. What would you change about it? The sink? The shower? The whole room? Regardless of what you want to change and what you personally find aesthetically pleasing in a bathroom design, TriStar Repair & Construction can provide the perfect solutions for bathroom remodeling Arlington residents can treasure for years. What are your bathroom remodeling goals? Establishing a clear idea about what you hope to accomplish with your bathroom remodel will provide our team with a clear direction and keep your pocketbook as full as possible. Establishing a budget gives you a clear picture about what to expect from your Arlington bathroom remodeling project and enables us to offer the amenities you want, need and for which you can pay. 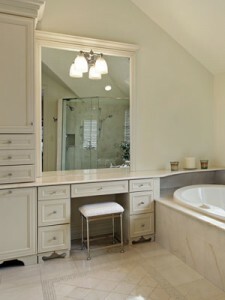 How much time can you allocate to your Arlington bathroom remodeling project? While our team is quick and efficient at its job, your bathroom remodel is not going to be completed overnight. We realize your time is precious and will do everything in our power to make the process of transitioning from your outdated bathroom to the bathroom of your dreams as quick and smooth as possible. If you have any questions or concerns regarding your Arlington bathroom remodeling project, give one of our knowledgeable representatives a call at (940) 381-2222, or send us a message. Bathrooms have to endure a lot of wear and tear and require maintenance and repairs at some point. Could your bathroom benefit from TriStar’s professional remodeling services? Does your lighting treatment need to be updated? Is your shower or bathtub outdated and showing signs of aging? Whatever the case may be, when it comes to Arlington bathroom remodeling, trust the professionals at TriStar. We are not satisfied until you are!